Wedding dresses are available with a wide range of bodice styles to suit all body shapes. If you’re having a gown made by a dress designer, or visiting a bridal store, they should be able to give you some advice about the best styles to suit you. Here are some commom bodice styles. This style is very suitable for brides who have a reasonable bust as it slims down the waistline by elongating the torso. A variation to this style is the high neckline. The halter neck exposes the shoulders; and a plunging neckline further opens the chest and neck area. Whilst this style does look very much like the halter neck, it is more versatile as you have straps or sleeves sitting on the shoulders, which does not expose them as significantly as the halter neck. This opens the neck and chest area more significantly making it more versatile to a bride with considerably broader frame. This style does not emphasis the shoulders nor the bust as prominently as the halter neck. The strapless gown is the dominant characteristic of the traditional princess style gown. This style opens up the shoulders, chest and neck completely. This is very feminine and extremely flattering. The strapless bodice can have either of the necklines available, however, some more complicated necklines (eg., scooped) would definitely require internal support to maintain the shape. The back of the bodice is generally a little lower than the front. 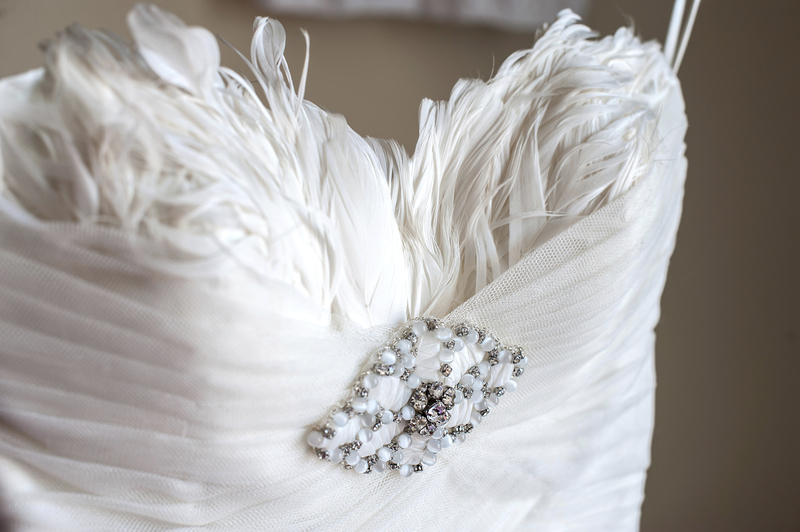 Unless you wear straps, you can not have a deeper plunging bodice at the back as it will simply fall off! This style is the same as the strapless, the only difference being that you can elect to wear a bodice which plunges far lower at the back. The most attractive feature of this style is that it emphasises the neck and chest area, as with the strapless style. The difference is that the delicate straps will enhance the shoulders. For the slimmer bride, a simply layer or two of satin with a string of gorgeous crystals across the shoulder (or two) will suffice. Alternately, the style is available with significant support structured into the bodice to support your bust taper in your waist. The bodice in this style ends immediately below the bust line, where the skirt begins. This creates an illusion that the skirt is so much longer, simply because it begins above the hips/waist. For this reason, this style is the most flattering for pregnant brides. Surprisingly, when worn with a fishtail or mermaid style skirt, this is the most flattering for a bride with curvaceous (wide or pear shaped) hips and healthy bust, as these will emphasise your slender waist. This look is very feminine. There will be no limitation to the neckline you chose with this style, ie, plunging, scooped, square or halter neck. The boat neck is very flattering, and even more so when worn with bell sleeves made of heavy lace. The significant feature of the boat neck is the distinct linear seam from one shoulder across to the other. This neckline can have variations, the most common having the neckline set a little lower than normal, with the fabric at the top of the neckline being gathered. This is very elegant, just like Audrey Hepburn. The Sweetheart neckline was very popular back in the 1980’s, worn with the big puffy sleeves. The bodice must have sleeves. The love heart shaped neckline is very soft and innocent. It is often a style chosen by the younger or more conservative bride. These two styles are very similar, the difference being that the square is, well, squareà whereas the scoop is curved. Both styles work best with a lower neckline. The aim of each of the styles is to open the chest and neck area. Are you sending Save the Date cards? Yes, we're using social media! This style is an addition to either of the abovementioned styles, whereby a sheer fabric layer such as organza or chiffon is sewn over the top of the gown, usually strapless. A very popular style is to have a boat neckline which compliments the linear top edge of the strapless bodice (above the bust). This style can also be worn with sleeves, sheer or solid fabric. This too is quite attractive, however, to be affective; you would need to be very particular about the style of the neckline of the gown itself and the design of the sleeve. Longer sleeves are really going to be more affective than shorter sleeves. Sleeves also look best with a sheer boat neckline. A sheer high round neckline will suit short sleeves. Ultimately, capped sleeves will not work with this style.